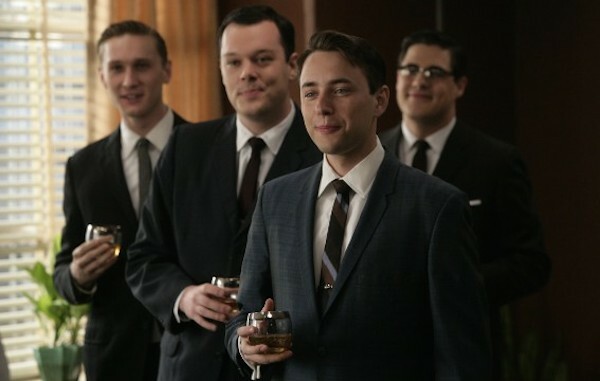 Despite winning fifteen Emmy’s during it’s seven season run, AMC’s Mad Men will probably be remembered best for it’s on-point styles. As the final season comes to a close, I wanted to highlight some of the most notable looks throughout the show and talk about how you can incorporate each one into your wardrobe. Everything about this suit style, from the fit to the colors to the accessories, reads professionalism. Slim, tailored cuts started to appear after World War II to complement the athletic build of soldiers returning from war, but in reality, anyone can benefit from a tailored look regardless of his body type. Loose, baggy suits make smaller men look like they’re drowning in their outfits and larger men look heavier than they actually are. As far as color, nothing looks more professional than a dark navy suit and white shirt. Contrasted with a dark tie, you’ll look like a CEO regardless of your position. Finally, pay attention to accessories, which should never be the focal point of your outfit, but should pull your outfit together. Limit yourself to one, at most two, accessories per outfit, like either a tie bar (as shown here), interesting cuff links, or a pocket square. This image from the later seasons shows the characters branching out from the more traditional styles by adding color. While Don adds a splash of color with the bright tie, Sterling stands out with the navy double-breasted jacket, plaid pants, and chelsea boots. It’s a bold look that not everyone can pull off and might not be acceptable for every workplace, but when done right, it allows you to stand out and make a bold statement. Your double-breasted blazer should always be in a dark, muted color, preferably navy. And while it’s possible to pair the jacket with matching pants as a suit, go with a lighter patterned pants to contrast with the navy jacket. Solid colors like grey or tan offer a clean simple look, while more complex patterns like the plaid shown above offer a bold look. Your shirt and tie shouldn’t compete for attention. 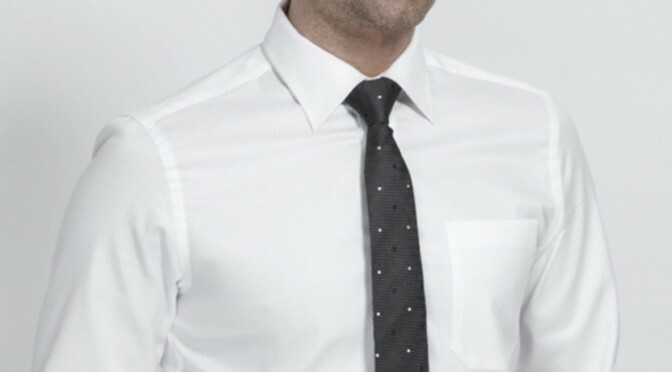 A white shirt with a solid color tie work best. 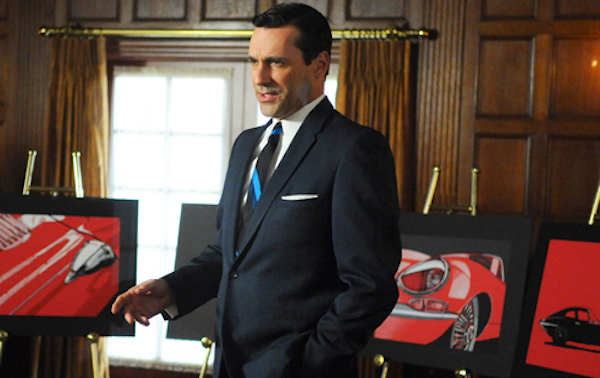 With this suit, Don Draper radiates power and masculinity. The navy departs from the traditional black just enough to give the suit some character without coming off as unprofessional. And while a tie that’s too bold or loud can be off-putting, a simple pattern like a solid stripe as shown above adds just enough flair to be interesting. As far as the details, a pocket square adds class, but for a formal setting like the office, go with a flat fold like the picture above. Always leave the second button of your jacket unbuttoned, and make sure your shirt cuffs are showing by no more or less than half an inch. If Mad Men showed us anything its how versatile a plain white shirt could be. Today, not only can you wear it with a miriad of work outfits, but it also transitions seamlessly to an evening shirt. A white, button-down shirt is like a blank canvas: it can be transformed into any number of looks. So whether you’re pitching a billion dollar deal or getting drinks with friends, consider a white shirt a necessity. Whether you’re going on a date, headed to a club, or just grabbing drinks with friends, chances are your work ensemble isn’t the look you’re going for. To avoid the hassle of running home to change, we recommend well-fitting shirt all day instead of just saving it for the evening. A custom shirt looks like an evening shirt by virtue of it’s fit, regardless of the pattern. Curated styles outside of your normal wheelhouse of solid whites and oxford blues like gingham, micro-check and Tattersall provides style that works for both the office and the evening. Swap your slacks for dark jeans and you can go from sleek and sophisticated in the office to laid back but still fashionable at night. Belt optional, tuck in recommended. 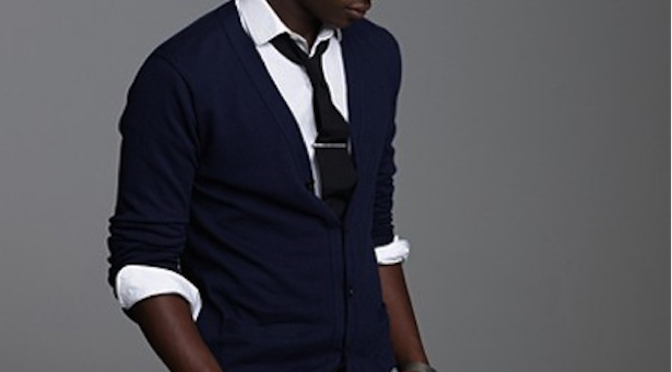 For the top, a basic cardigan is the perfect replacement for your suit jacket. A linen blazer is the perfect summer complement. Both provide sharp, timeless looks that never go out of style. A skinny work tie can stick around for the evening but anything wider than 3” has to go. If you want to be bold and add some attitude, opt for a leather jacket or even a bomber jacket instead of the cardigan. Both can inject some character into your outfit without looking like you’re trying to draw attention. The key is color. Whatever type of jacket you choose, make sure it’s in a dark color, preferably black, dark blue, or dark brown, i.e. something understated and simple that will contrast well against your patterned shirt. Remember, the shirt is the place to experiment with colors and patterns, not the jacket. After figuring out which colors best complement your look, the next step is finding patterns that match your style and personality. Check patterns, from subtle micro checks to strong Ginghams, are a great way to add character to your wardrobe while retaining a classic look suitable for work. Checks match well with your solid suits or slacks and multiply the number of ways in which you can bring your suit, shirt and tie together. In addition to a unique fit, your custom shirts allow you to walk into the room with a style all your own. We recommend starting with navy and blue checks, which would well with most suit colors and red ties. This combination matches most office environments. 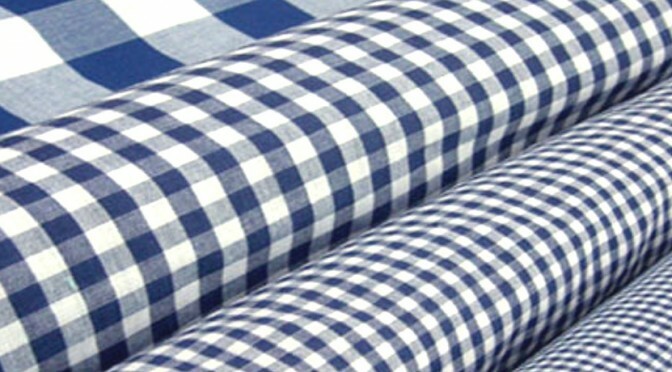 From there, experiment with multi-color Gingham patterns with your secondary color reflecting the current season. In the winter months, go with smaller checks in more muted colors that pair well with dark suits. Then in the spring and summer, brighten your color palette with pinks, purples and lighter colors. Your shirt pattern should complement your suit and tie the look together, not stand out for attention. Save those for social occasions. Oversized checks and plaids are best for the weekend as well and pair well with a dark pair of jeans. Nothing beats a cold beer after a long workday, sooner the better and thus why happy hour is well happy. Many of us head straight there from work and choose to either stay in our suit or pull a Superman in the closet. No one wants to spill on their suit jacket or look like an intern because you’re the only one casually dressed. We recommend swapping your slacks for a dark pair of jeans before you leave. And then hanging up your jacket once you arrive at the bar. Wearing jeans when traveling is a great way to keep a clean look but also avoid wearing our your pants, which wear down faster than your suit jacket. Navy chinos also work. This option helps you avoid untucking your dress shirt, which should be avoided, especially if wearing slacks. Most dress shirts are cut long so they stay in your pants. We know the temptation is to want to loosen up but untucking your shirt does not make you look younger or hipper. It makes you look like the Penguin in Batman, an unkempt character. So keep your shirt tucked into your dark jeans, you will look better, save your suit and feel comfortable. Tie, belt and rolling up sleeves are optional. 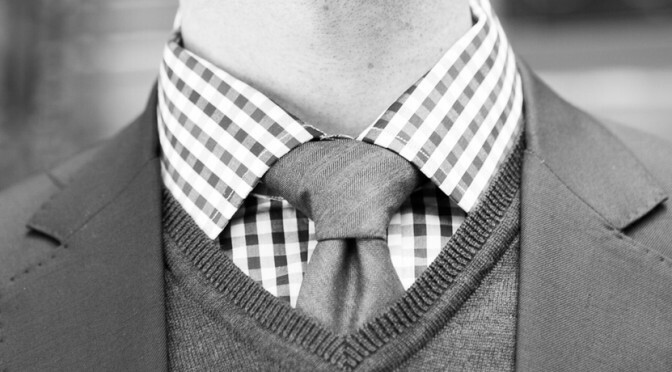 The shirt collar is the closest to your face and therefore the most important style. Somewhere along the way, we ended up with thousands of collar styles. But let’s cut through the clutter and highlight the three you need to know. Semi-spread: the most balanced and flexible style that works well across formal and casual styles, with and without a tie. This style complements the most face shapes and occasions. Traditional spread: best paired with formal shirts to be worn with suits and a strong tie. This collar fits well with wide lapel, power suits but less so with today’s skinnier lapels. Button-down: the classic style that best fits casual styles to be worn under a blazer on the weekend, not with your pinstripe suit. Common on check patterns. Tie optional. Too many fine cotton shirts in great patterns are limited by their collar styles, be it wide spreads that require a tie with a full knot or niche styles like tab collars. The goal of every wardrobe is to maximize your looks and provide versatility. Don’t be the guy that has to go home and change in order to hit happy hour. Select a collar style that works for you, not the other way around. 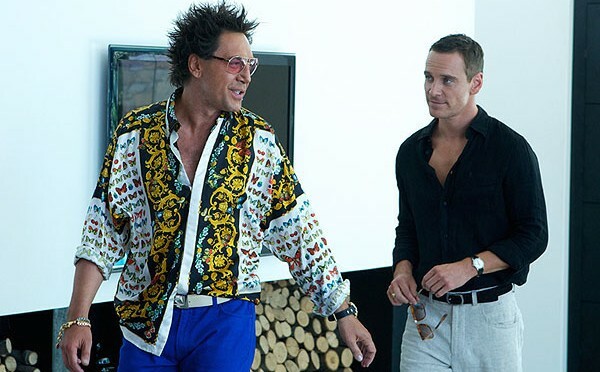 The Counselor includes a slew of stars, which sometimes is a red flag for movies. Sometimes it’s not, as in the case of American Hustle. Whether you enjoyed the movie or got tired of Cameron Diaz’s cheetah spots, there were some great styles by well-dressed Michael Fassbender to take note of. Given the movie takes place along the Mexican border, the styles fit well with the upcoming summer. Michael Fassbender, a Texas lawyer in the movie, got contrast right. Summer does not mean pastels, that season is spring. The best color to complement your summer tan is black. The black watchband and belt tie the look together. Linen shirts and shorts are meant to be a little baggier and casual, but with the right colors, they can create a sharp look. The color of his blue suit is perfect for summer. Away with the dark Navy’s of winter. The peak lapel is slim, giving it flexibility across formal and social occasions. The muted stripes provide a perfect canvas for the strong red tie. Your shirt and tie should not compete for attention, like dancing, someone has to take the lead. The best part of the style in this movie is the contrast between Michael Fassbender and the character of Javier Bardem and Brad Pitt. Ornate silk butterflies are reserved for drug pins so stick with the style of Michael Fassbender. The oxford white dress shirt is a staple in every wardrobe. It’s likely where you started when traveling on sports teams with your khaki’s and navy blazer. It also represents the rigidity of your first interview suit that was likely void of style or creativity. To be blunt, white shirts should be worn to work in the summer and worn during the evenings in winter. The most basic reason is elementary; white reflects light and therefore keeps you cooler in the sun. Your white shirt also shows off your tan. However, be aware that any sweat marks are highly visible so wear an undershirt if your commute involves melting on a subway platform. When it comes to undershirts, stick with a white V-neck, which allows you to unbutton your shirt collar without revealing your crewneck. Combined with your light gray summer suit, your white shirt creates a great canvas for your colorful ties. They will really pop against the monochromatic background. Go with paisley or light purple patterns. In the winter, your white shirt provides a classic high contrast look with your dark suits. Think Frank Sinatra. We recommend a textured, skinny black tie that provides a great outline and makes you stand out.